2 Bedroom+Den 1600 Sq Ft. Recently renovated fully furnished and outfitted 2 level 2 bedroom suite with private patio, barbeque, patio furniture and garden tended by a gardener in the heart of Riverdale Greektown - satellite television, wireless internet, phones and laundry. Just a short walk to the subway, shops, cafes, outdoor markets and restaurants on the Danforth. Street parking permit available. The suite showcases a beautiful art collection. 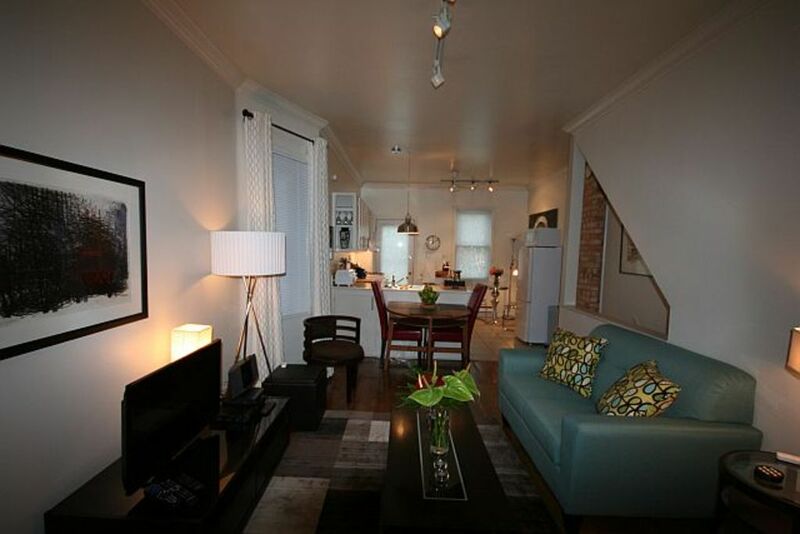 Really comfortable, spacious, and well-situated house in Greektown. My brother and I stayed here for a week on the occasion of our niece's wedding. We found it very comfortable, and quite quiet, and it is very well equipped with everything one might need, two comfortable beds and a quality shower being particularly important. While it was almost unbearably hot and humid during our stay, this unit has high ceilings and stayed fairly cool, such that we hardly used the A/C. Sitting in the shaded back garden was also nice, as was the close proximity (150 metres) from the Subway station... a subway that gets you to most of the main parts of Toronto's downtown in only 10-20 minutes. All in all an excellent choice as a place to stay, this house and the neighborhood it's in. Pros: The location of this home is fantastic; it is within walking distance of the subway and has many great restaurants surrounding it. The home is nice and comes with all the furniture and appliances you should need. Grant, the owner provided fresh flowers for us upon arrival. Cons: Every ~4 minutes, the TV would reset itself... this made watching TV pretty unbearable. The couch is tiny and pretty uncomfortable to sit on for long periods of time. We had some difficulties communicating with the owner. He forgot to give us our parking pass upon arrival but was very nice and refunded us the money it cost us to pay for parking the first night. He informed us that a plumber would be arriving during our stay, but the plumber arrived hours ahead of the time we were told. Upon arrival, Grant and the plumber just walked into the home without making sure we were decent or ready (I was in the shower at the time). The communication when the plumber left was also very unclear as to whether he was finished or coming back later. Needless to say, we felt like we had very little privacy in the home. Just stayed here for a week. The place is very nice, comfortable and close to subway and greektown. Grant went above and beyond to make sure everything went smoothly. Definitely recommended. My family and I had a wonderful stay. The kitchen had everything we needed for us to prepare all our meals at the house. The TTC station was a very short walk down the street and gave us easy access to the rest of downtown Toronto. Grant was a fantastic host. He responded quickly and went above and beyond to make our stay comfortable. As a family with two young boys, we found Grant's apartment very comfortable. With fine weather throughout our stay, we appreciated the charming garden....not to mention Withrow Park and Riverdale Park. Situated just a few steps away from Pape Station, one has easy access to the center of Toronto, via Subway. We took the 72B bus all the way to Queen's Quay, to take the ferry to the Toronto Islands, walk over to the CN Tower and the old round house (a train garage now converted into a museum and a micro-brewery). The 185 bus takes you to the Ontario Science Centre, where one should really spend the day! as it is GREAT! Our beds were comfortable, and the heat worked when it started to get a bit chilly at night. The bathroom could have been a bit cleaner, and the towels smelled musty, so I washed them and dried them in the laundry room. All in all, we highly recommend this apartment (2 floors, bedrooms down below). Situated two steps to a peaceful and charming residential area (where I spent my childhood), and in the heart of Greek Town, with a variety of choice restaurants, Grant's place serves as a retreat from the highrise cement blocks, dizzying lights, and noise of the downtown core....which remains just a Subway ride away. The house is located near the Danforth in central Rverdale which has many shops, cafes, restaurants and night-life. A 5 minute walk to the subway easily accesses the parks, beaches, museums and galleries of Toronto.